Traveling and dancing have a lot in common -- you don't really want to do either, they both make you sweat, and eventually you get totally served! Bonding the two even closer: BoomCase. 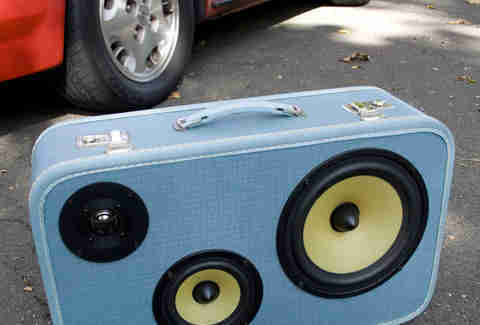 The ingenious invention of a farm-raised Cali guy, his bro, and his GF, these hybrid ghetto blasters're upcycled from vintage suitcases and sprout from a history of tinkering with music, a hobby that led to everything from speakered buckets, to audio necklaces, to an insanely rigged-up military flatbed known as the Temple of Boom, which surprisingly doesn't require a Harrison Cord. 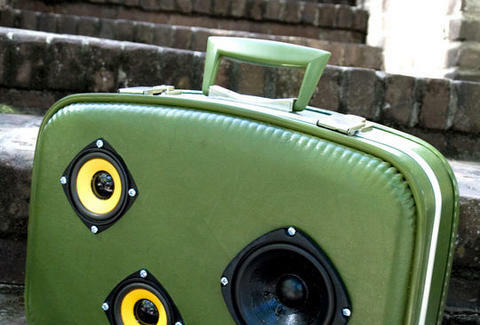 Each 30-/50-/200-Watt self-powered (8+ hrs) case's painstakingly designed for optimal audio out of leather & wood vintage suitcases sourced from thrift stores and estate sales, set up with jacks, batteries, and a facade with artfully arranged speakers, making them the Carl Paladino of portable music. Current cases include a large herringbone job, a red-with-gold-snaps Lady Baltimore, and a pint-sized blue piece emblazoned with "Going to Grandma's" next to a tiny dude and his dog; plus, each one can be further customized with everything from iPod chargers, to wireless audio playback capability, to a solar powered battery, which sadly won't work if there's a Black Hole Sun. If other people's tunes don't cut it, you can also opt for a jack for playing your electric guitar or synth, which have in common that people don't want you to do either.